Sustainability. Innovation. Disruption. Words that get used freely. The time has come to prove what we say. Across the packaging value chain, sustainability, innovation and disruption are all more necessary now than ever before...as long as there's transparency too. The bright light that is shining on the plastic packaging industry is not always flattering; it shows up our imperfections. But with transparency, that bright light is a good thing. 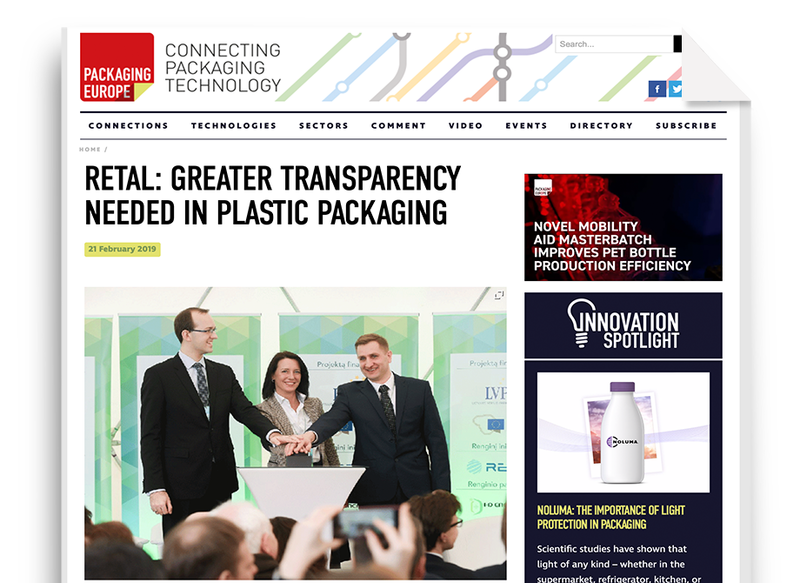 For us to be as honest and progressive as possible, to create and support a plastic packaging industry that is fit for purpose from both a consumer and an environmental perspective, transparency has to be at the heart of everything we do. The discrepancy between what consumers think about plastic packaging and what is actually true is huge. For example, a commonly-held belief is that plastic bottles can only be recycled once, when actually they can happily be recycled 7-9 times before quality is compromised for food-grade applications, and many more times for non-food packaging. And an organic cotton shopping bag would need to be reused thousands of times to match a plastic shopping bag for water, energy and additive consumption in production. Yet consumers think that choosing cotton shopping bags over plastic bags is the sustainable option...but how many cotton totes do you actually own? RETAL has recently joined PETcore, the responsible voice of the European PET value chain, with Duffaut active in the non-profit's working groups that is focused on the long-term stability of the PET industry. He concludes, “By creating responsible plastic packaging that has a lighter impact - including light-weighting of the preform and the closure, highly efficient energy management across production and smart use of renewable energy - we are determined to be part of the solution."